Gary Presley: "We're Having a Sale on Apostrophes Today"
"We're Having a Sale on Apostrophes Today"
It requires a certain measure of indifference to move artfully through this world. There are things that matter. Things worth fighting for. And there are things a sane person will let pass, knowing in the great scheme of the infinite only a few people, places, and actions carry the weight of a line drawn in the sand. I had a chance to address my theory last weekend when I encountered a situation where my pledge to indifference required an affirmation. And so I came to a point where I made the Instant Internal Assessment necessary to function without immediate resort to mood altering chemicals: expense of energy versus probability/value of altering opinion. As usual, I usually found the former to outweighed the latter. My wife and I had some family photographs taken, and in the process we ordered photographic Christmas cards. We were going through the "greetings" with the fellow who was assisting us. He suggested "Seasons Greetings." I was being my usual contrary self. "Too bland," I said. "It's a religious holiday, at least for us." We settled on "Peace on Earth. Goodwill toward Men." "How do you want to sign it?" he asked. "From the Presleys," responded my wife. He wrote "From the Presley's" into the computer ordering system. 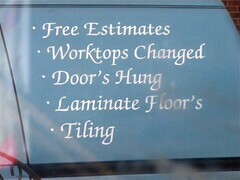 I said, "There's no apostrophe." "Sure, there is," he replied. "The card is from you, the Presley's. The family." "An apostrophe s is possessive," I said, and without raising my voice. "It's the Presley's card, but the card is from the Presleys, which are the three of us here, which makes more than one Presley, which is why it should be plural." "Better listen to him," my wife said to the man. "He's a published writer." "Well," the guy replied, "I'm right. I've always written it that way." I gave up. "How about changing it to Happy Holidays from the Presley family? That seem to satisfy him, but I watched carefully over his shoulder to to make certain he wasn't writing it as Happy Holiday's. Aaaaaagh! I would have gone ballistic. Kudos to you for keeping your cool. I've actually emailed websites before to notify them about punctuation errors. During the year I spent in China, where you can't really blame anyone for getting the English wrong, it was like a game to spot the worst examples of Chingrish.